Alert visitors and passers-by to the presence of your pet with the Whitehall Black and Gold "Beware of Dog" Statement Plaque. The slightly arched top of this sign contrasts with the angular frame, and small squares in each corner add a bold geometry to the piece. The gold colored letters on the black background create a dramatic and noticeable marker, and the included, 18" long lawn stake makes it simple to place this unit in your yard. The aluminum construction and weather resistant paint will keep this plaque visible and lovely for many seasons. 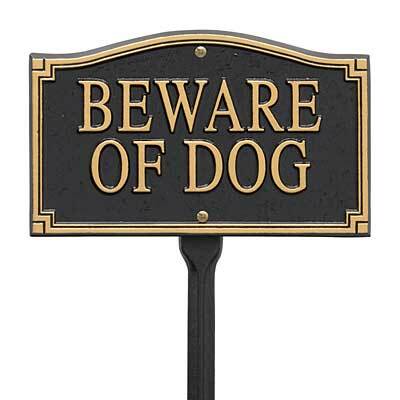 Warn delivery personnel and neighbors of your pet with this Black and Gold "Beware of Dog" Statement Plaque. Made in the USA.